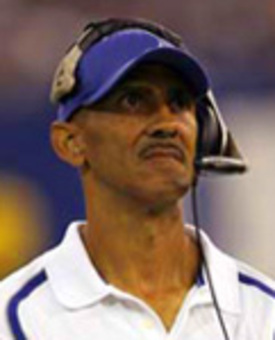 Tony Dungy and Lovie Smith have something more in common than Super Bowl Games. Their faith in Jesus Christ. As excited as they are about having been in the Super Bowl, they both have something even greatyer than that. That's why their joint website is called "Beyond the Ultimate." There is a website with their stories and the stories of other Super Bowl players. Check it out by clicking here. I did another story on Tony Dungy's faith and the tragic suicide of his son when I first started the blog. Check it out by clicking here. this is a cool picture of Tony. Its also a neat story about the both of them. Yes! I was so excited to hear about this on Monday morning before I went on the radio... I was checking my web site and there was a bulletin from Michael W. Smith who's a good friend of Tony Dungy's, so I announced the Beyond the Ultimate web site on the radio all day on Monday! :) Good stuff!